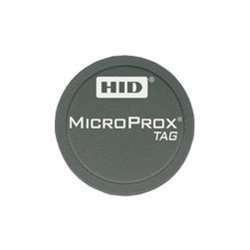 The HID-1391LSSMN is a MicroProx Tag transponder that works like a proximity card when attached to any non-metallic card or device. The 1391 comes pre-programmed, with a low 125kHz frequency. The front packaging is gray with an adhesive-backing for quick and easy mounting. The tag features sequential numbering and does not include a slot punch.